A Titanic memorial plaque at Vokes Park in Southampton, UK was thought stolen earlier this week. 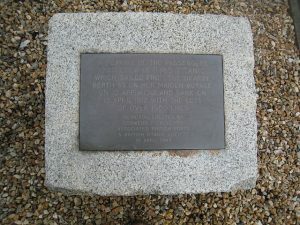 The plaque, erected in the 1990’s by the British Titanic Society, was in fact removed by staff of Associated British Ports. The plaque had fallen off its plinth and was in danger of being stolen reports BBC News. The plaque will be returned and affixed to prevent it from being stolen but the date has not been announced. Another case of something unintentional ending up as a Titanic memorabilia. 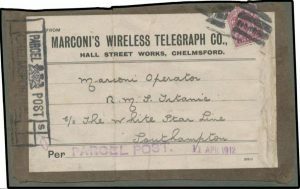 A parcel label that possibly was on a package of blank telegram forms for the Marconi wireless operators on Titanic is up for auction in Australia reports United Press International (UPI). The package was given to the first office on Olympic, Titanic’s sister ship and to be delivered to Titanic when it arrived in New York. It is believed the Olympic first officer gave the label as a souvenir after Titanic sank and eventually ended up with a private collector who is putting it up for auction. Mossgreen Auctioneers is handling the auction and is expected to fetch $20,000. Well Thanksgiving has come to an end and today is called Black Friday here in the United States. People might think that an odd name considering what happens. Many retail chains, mostly the bigger ones, offer special deals on Black Friday to lure people into their stores. It is a clever marketing idea to get a lot of stuff off the shelves for the Christmas holiday. So they deep discount on anything they want to get rid off. Loss leaders are put up to reel in many to buy even more than they intended. The desire to maximize the profits led many chains to open up on Thanksgiving. This has not been welcomed by many employees who want to spend more time at home. Then again some retailers do sweeten the pot, so to speak, with time and half pay. Some think that is required by U.S. federal law but it is not. Unless you work over forty hours a week, that rule does not apply. It is up to the employer to decide if they want to pay you extra for working on a holiday. If you are part of a union, then in the contract with the employer it may specify that working on holidays gets you time. Most employers who can afford usually will pay time and half to get their workers to come in. It takes a lot of people to stock those shelves and check them out at the cashier stand. I decided this year to not put up the usual safety warnings about deep frying turkey. This video by the Fresno fire department explains it pretty well. Hey you do not need an expensive outdoor fryer. You can buy a electric deep fryer designed for the same thing for the kitchen. You measure in the oil precisely, insert the turkey and close the lid. I saw one video of an old guy wearing shorts and no shoes trying to put the turkey in the fryer. The oil overflowed, flames erupted and the man ran for his life while someone called 911. Enough said.